Tour of the Bearn in southwest France. The magnificent courtyard of the Chateau de Pau was a fitting backdrop to the last in a series of Battle of the Somme concerts given by the city’s own Ensemble Orchestral de Pau (EOP). The orchestra played four concerts for the general public as well as putting on an open rehearsal performance for schools. Following an approach by the municipality of Nay, the EOP decided on an ambitious programme of a series of concerts in the Bearn, a region of southwest France bounded by the Pyrenees. Nay had already hosted a very successful exhibition to mark the centenary of World War I and joining the Somme 100 Film Centenary Tour seemed a fitting continuation of the theme. The performances themselves went off without a hitch in very different venues – from multi-function community halls to an intimate theatre to the grandeur of the chateau. Although some of the audiences were smaller than anticipated, all those who came praised the musicality of the orchestra and the way the score enhanced the impact of the film. At each performance there were always a few audience members with direct links to the Somme, such as a father or uncle who had taken part. Paying homage to that generation’s sacrifices was a major factor in people’s attendance. The open rehearsal at Morlaas was a huge success, with some 450 pupils of local schools and colleges attending both the run-through of the concert and also an after-show session in which members of the orchestra talked about and demonstrated the instruments they play. For the final concert at Pau, the organisers were delighted to welcome both Laura Rossi and Dr Toby Haggith, senior curator at the Imperial War Museums., who each gave a short introduction in French to the film and the music. The full programme began with a number of pieces by Harmonie Paloise, a band of mainly brass instruments, followed by the EOP and The Battle of the Somme. The weather was very kind, allowing the concert to take place in the open air, framed by the magnificent courtyard of Henri IV’s famous castle. It’s total darkness in the auditorium. “The only light is from the fireflies,’ jokes Guy Brunschwig, saxophone tutor at the Pau Conservatoire, conductor of Harmonie de Pau and, this year, of the Ensemble Orchestral de Pau (EOP) – a group of some 40 musicians (90 per cent amateurs) who each year take music into the countryside. It is they who are playing in a darkness pierced by tiny lights – the famous fireflies – fixed on to their music stands. Why the dark? Because, while they play, The Battle of the Somme, a silent documentary of 1916, held at the Imperial War Museum in London and listed on the World Memory Register by Unesco, is being projected behind them. For 75 minutes the audience is plunged into this battle between British and French soldiers and the German army – one of the most important battles of World War I. The film focuses in particular on the British soldiers in the trenches, subjected to massive bombardments. A soundtrack accompanies these documentary images, following the tempo of the explosions: and this music is played live by the EOP. This work for symphony orchestra was written in 2006 by the composer Laura Rossi, at the request of the British museum. 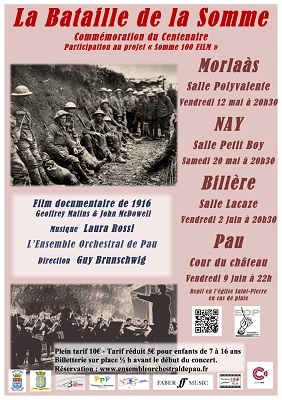 After two concerts at Morlaas and Nay on the 12 and 20 May, the EOP will perform the piece a third time at Billere this Friday and at the Chateau de Pau on 9 June, in the presence of the composer and of Toby Haggith, representative of the IWM.